Dozens of possible trading chart candlestick bar placement combinations and permutations are possible. These special “emotional extreme” candlestick patterns, including reversal patterns, are unique to candlestick analysis and do not appear in the standard bar pattern analysis. Bearish engulfing candlestick: An engulfing pattern signals the reversal of a trend. The word engulfing refers to the open and close of the bar encompassing a wider range than the open and close of the day before. In this figure, the engulfing nature is the dominant characteristic so that the lower close pops out at you, even though the bar also has a higher open. When a bar starts out at a higher open but then closes at a lower level, the bears won that day. A bullish engulfing candlestick is white. The higher close is visually compelling because the real body is so big. 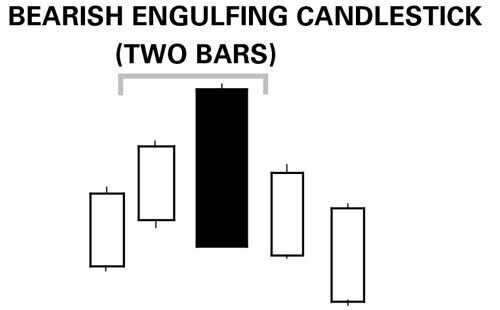 The engulfing candlesticks require two bars. 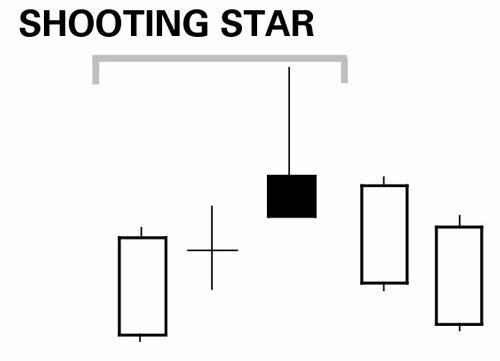 Shooting star: You can characterize the shooting star pattern by a small real body and a long upper shadow. The long upper shadow in an uptrend implies a failure of the trend — a failure to close near the high. The addition of the doji bar indicates traders were already becoming indecisive the day before.